What are University of Pennsylvania's average SAT and ACT scores? What are my chances of getting into University of Pennsylvania? How do I improve my chances of getting into University of Pennsylvania? Located in West Philadelphia (born and raised! ), Penn is one of the oldest universities in the country. However, don't let that age fool you: Penn is known for its high standards and accomplished alumni at the cutting edge of their fields (Warren Buffett, Elon Musk, and Noam Chomsky ring any bells?). If you love an academic challenge, live to learn, and have astronaut-level ambition, applying to Penn might be the right choice for you. Why do we say you might need a bit of luck to get in? Well, the numbers say it all. Penn is a tough school to get into. In 2018, they only admitted 9% of applicants (down from their 11% average over the last 5 years). That means that, out of every 100 applicants, they're letting in around 9 (told you we were good at math). You may have a slightly better chance of getting in here than you would at Harvard, Yale, or Princeton, but not by much. Ironically, though, as much as the admissions team at Penn is looking for someone exceptional, their application process is very straightforward, and lacks unnecessary bells and whistles. You'll be submitting a vast of majority of the same materials across different institutions, and Penn won't present any major surprises in that regard. You'll need mostly the same materials as other university applications (we love it when we can save time by using copy + paste, but be careful and double-check everything!). There will be some Penn-specific things you'll have to produce as well. Along with your application, Penn wants your official school report, a counselor recommendation, two teacher evaluations, a mid-year report, and a Penn-specific essay. Here's some more information on the application requirements for Penn. Every single item that you submit for your application to Penn has to be exemplary, so don't ruin the beauty of your 4.0 GPA, full stack of extracurriculars, and stellar essay by making a typo. Because of the mountain of stuff that Penn wants in your application dossier (a fancy French word for "every piece of paper about yourself imaginable"), you'll want to get started on your Penn application early to make sure you can get it all done well before the deadline. The Application. Who are you? Where did you go to school? Where do you live? What did you eat for breakfast? These are the kind of deets, along with an essay describing yourself, that you'll have to submit on your basic application. You've got two options here: Penn will accept either the Common App or the Coalition App. The Penn Supplement. Penn is no-nonsense when it comes to the supplemental essay. Topic-wise they are to the point, crystal clear, and even cool enough to post the essay question on their website. The question will basically ask what academic interests you see yourself pursuing at Penn. Since the Shmoopology major won't be offered until 2029, you'll have to settle for something slightly less exhilarating, like a major in Finance or Biology. Application Fee or Fee Waiver. Gotta keep the lights on and the cheesesteaks warm. Penn will waive the application fee in certain circumstances (and the information on how to apply for a waiver will be in your application). Everyone else will be shelling out $75 for the submission of their app. Counselor Recommendation. Your guidance counselor will have to write a letter of recommendation for you, so make sure that this wonderful individual is untouched by any and all senior pranks and tomfoolery. This letter is different from the school report, which provides information about the entire school. Instead, it's all about wonderful, one-of-a-kind you. Guidance counselors have a lot of recs to write come application time, so ask early, be a sweetheart, and if you've got special love for them, don't hesitate to get them a Hallmark card after they've helped you out. 2 Teacher Recommendations. Specifically, you should ask for letters of recommendation from teachers who taught your upper-level core-content classes, i.e. your AP or IB teachers, for example—not your sophomore gym teacher (no matter how much they like you, and think you're the best darn rope-climber they've ever seen). SAT or ACT test scores. The SAT and the ACT are like fraternal twins—they share a lot of the same DNA but they have their own distinct personalities. It doesn't really matter which one you chose to take. You can even take both. But whatever you decide, you should take whichever test you want by December (at the very latest) in order to have the score to submit to the school—or earlier if you're applying early action. (But really, you should be gearing up for one of these tests in the winter or spring of your junior year.) When you register for the test, make sure to input the codes to have your scores sent to Penn—2926 for the SAT, 3732 for the ACT. If the thought of standardized tests makes you reach for the puke emoji every time, we at least have some good news: as of the 2018-2019 school year, Penn no longer requires ACT or SAT essay scores. TOEFL or IELTS Academic Scores. Penn students come from all over the world, but they all have one thing in common: some command of the English language. Oh, and they also all got into Penn (duh). So, okay, two things. Anyway, if English isn't your native language and you haven't spent at least three years at a secondary school where the classes are primarily given in English, you'll have to submit your TOEFL exam scores. If the TOEFL isn't readily accessible, Penn will accept scores from the IELTS. As if this pile of paperwork wasn't enough, you may even have to have an interview with a volunteer Penn alumni interviewer. These interviews are a great way to show that you'll be a good fit for the Penn community, so make sure you bring all of your charming, authentic self to bear. There's no use looking up what Penn students are like and then trying to mimic that. It won't come off as the real you, and you shouldn't believe all of the stereotypes about certain colleges that you read on the web anyway. We know the internet has never lied to you before, but just trust us on this one: the best way to get a feel for a college is to get on campus and check things out in living color. What are UPenn's average SAT and ACT scores? You've likely been taking standardized bubble exams your whole life. Well, little did you know that these exams were preparing you for the mothers of all bubble exams: the ACT and the SAT. In the marathon that is high school, this represents the final hundred meters. We know the burn might be killing you, but you'll look like a silly person if you pass out just in sight of the finish line! The ACT and SAT may not be the finish line themselves, but they're important steps in that final push. You'll need to dominate these tests to have a shot to get in. Luckily, we can help on this front too! Here are some cold, hard facts on the kind of scores Penn is looking for. The average SAT score at Penn is 1485. The 25th percentile score is 1420, meaning that 25% of admitted students got a 1420 or lower. The 75th percentile score is 1550, meaning 75% of students got a 1550 or lower—and 1550 is nearly perfect. The numbers for the ACT are also as astronomically high. The average ACT score for the class of 2022 was 34. The 25th percentile ACT score in 2018 was 33, the 75th was 35. So, two points off perfect. No pressure. If you're wondering whether to submit the SAT or the ACT, it doesn't seem to matter either way (as long as your scores were good): 46% of students submitted the SAT, 54% submitted the ACT. The essay components of these exams are not required. Your SAT or ACT scores, as well as your GPA, are extremely important for Penn admittance. Consider these the minimum bar you'll have to reach in order to get in—without them, you won't be admitted. The only way you're strolling into Penn with crappy scores is if Benjamin f himself writes your recommendation (and he's taking a break after signing a slightly less important document called the U.S. Constitution, so give the guy a breather). What are my chances of getting into UPenn? Your chances of getting into Penn are low, no matter who you are. Even if you have perfect exam scores, stellar grades, knock-out essays, and excel outside the classroom at scaling mountain ranges/ rediscovering extinct species/colliding elemental particles, it won't be enough—you'll also have to have a bit of luck. In 2018, 40,413 students applied to Penn and only a few more than 3,500 were admitted. But if you're up for rolling the dice, we recommend you give it your all and do your best to get that acceptance letter. Penn, like the other Ivies, wants to be the ultimate hand-me-down, and get passed on from generation to generation. If your parents attended Penn, your chances go up a bit—16% of the Class of 2021 are from so-called "legacy" families with Penn-flavored bloodlines. But you're still far from being a shoe-in. Even if you're a legacy, you still have to work hard to get admitted. The average GPA for 2018 admitted students was 3.93 out of 4. If you have a lower GPA, you'll have to have higher SAT or ACT scores to make up for it. How do I improve my chances of getting into UPenn? Just because something is a long shot doesn't mean you shouldn't give it a go—if everyone took that advice, we would still be rowing across the Atlantic. There are a lot of things you can do to improve your chances of Penn admission. And, as a bonus, these things will also help you get into other schools should you not find the Golden Ticket. Take tough classes. Penn isn't just looking for you to have a 4.0 GPA. If your course load is all Interpretive Dance, Intro to Needlepoint, and Pogo-sticking, that won't cut it (although your high school sounds super fun). Penn wants to see A's in advanced core subjects, so stack on the AP or IB classes, but even if your school doesn't offer those, take the hardest classes you can ace. Always keep in mind how important that high GPA is, but make sure you're also taking classes that will challenge you. Even better if you can take a course or two at a local college or university while you're still in high school, showing that you're ready for the more advanced course load coming down the pipeline. Write your own essays. Admissions counselors read hundreds of thousands of essays every year, and they can see plagiarism from a mile away. Trust us, they've seen it all—and they'll know if your big sister wrote your essays. Tell a story about your life. You might be worried because your high school didn't offer AP classes, or you had to work so you weren't able to be captain of your school's Shmoop Fan Club (lifetime of regrets). But honestly, that's fine. You should use your essays to tell a story about how you used all of the opportunities available to you to your best advantage. Where have you worked? What did you learn? How did that enrich you as a person, and how do you plan to take those lessons and continue progressing? Take your accomplishments and put them in perspective, and tell your unique story the only way that you can tell it. Show commitment. The Penn admissions committee is looking for applicants who know what they want and aren't afraid to go after it (within the bounds of U.S. law). They'll want to see your dedication and ability to see things through, even when the going got tough. And sometimes it's the way you pushed through those tough times and what they taught you that the admissions committee will find the most impressive. As they say: if the mountain was smooth, we couldn't climb it. (However, we could get helicoptered to the top and be in for the slide of our lives. Shmoop thinks big). Getting into Penn is sort of like crossing the Sahara. You have to prepare for weeks or months, pack enough materials, get a good guide or two, and still get lucky along the way (points to the champion who takes our analogy to heart and shows up to Penn Orientation on a camel). Don't leave your desert journey to chance, however—Shmoop knows where all the dopest oases are and would be happy to show you the way. One of the most important elements of your college application is the record of every class you've taken in high school and your grades—your transcript. No pressure. As we've already noted, Penn wants to see that you're taking stellar classes on your transcript. Which means you should be challenging yourself at every turn, and might want to consider dropping Intro to Naptime Strategy. Check out our article on how to Beef Up your Transcript, Even if You're a Vegetarian for more deets on this process. Ah, summer vacation…a time to kick back, relax, perfect your handstands. Sure, that's fine—but not if you're trying to get into Penn. A stand-out college application requires you to use your summer vacays wisely. You should be clocking hours at a worthwhile job or internship, enrolling into an extra class or two, doing some serious summer reading, and generally staying productive. We've got a ton of ideas of how you can use your sunny summer break to make your Penn application shine in our article How to Spend your Summer Vacation. Penn loves well-rounded people. Having good grades, impressive sporty accomplishments, and a couple hundred patents to your name are all good things, but part of being well-rounded also means having read, like, a lot of books—not just the ones on the required reading list. We've got a good selection for you to start with on our Manageable College-Bound Reading List. Winning your school's talent show. Knowing sign language. Having an effortless dab. These are all admirable feats (well, except maybe the last one), but there are better ways to stand out on your college admissions applications. Penn is looking for people who have showed off their smarts in a competitive environment. We've rounded up some of the best arenas for you to demonstrate your braininess in our article Win a Bunch of Competitions. Penn is an elite school. It's like the university version of Constance Billard-St. Jude's, minus the very silly school uniforms and no-cell-phone policy. Penn is academically competitive, a great place to network, and not for slackers. If that kind of no-holds-barred approach appeals to you, then there are other elite schools you might want to consider. After all, if you're preparing to apply to Penn, you're probably a good candidate for some other schools of similar caliber. Harvard University: Penn and Harvard Universities are often mentioned in the same breath, and with good reason. (Not literally in one breath—that's too many syllables.) They're both extremely academically competitive schools with low admittance rates and excellent opportunities for networking, but Harvard is going to be a significantly longer shot that Penn. If you're interested in really challenging yourself though, Harvard might be another school for you to consider. Harvard's proximity to Boston mirrors Penn's West Philly location, so if having access to a larger city is important, then give ol' Harvard a shot. Cornell: It may be one of the lesser-known Ivies, but don't let that make you think you'll just be strolling in here, Penn applicant. Cornell has a 15% acceptance rate, so it is no cakewalk. 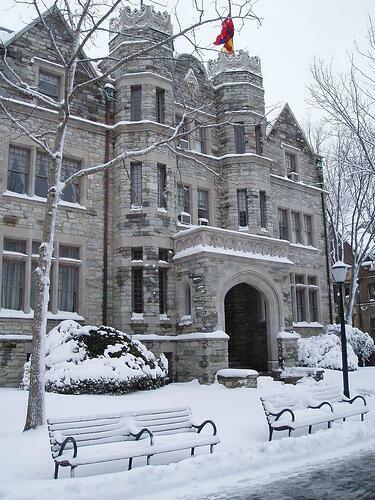 Located in Ithaca, NY, this powerhouse can count 58 Nobel Laureates among its alumni. UCLA: While somewhat easier to get into than Harvard, UCLA still boasts a high-caliber curriculum, who's-who of alumni, and killer post-graduation opportunities. Also, it's a lot easier to cram for midterms on the beach than in a snowbank. Located in, you guessed it, LA, UCLA may have all of the perks of Californian weather, but it's significantly lacking in the calm surfer bro persona. You'll be working just as hard as almost any East Coast elite scholar, so make sure you bring your A-game if you've got it in your sights. With over 30,000 students enrolled, UCLA is going to significantly dwarf Penn, so think long and hard about this mini-city of a university if big schools aren't your thing.